With only Milhouse and Sweet Tooth up for eats after Friday night hockey, the world was my oyster. Why? Well, these 2 faithful eating companions are always game for food anywhere, anytime. Hence, I could choose anything I wanted! It's like Lindsay Lohan in a liquor store... 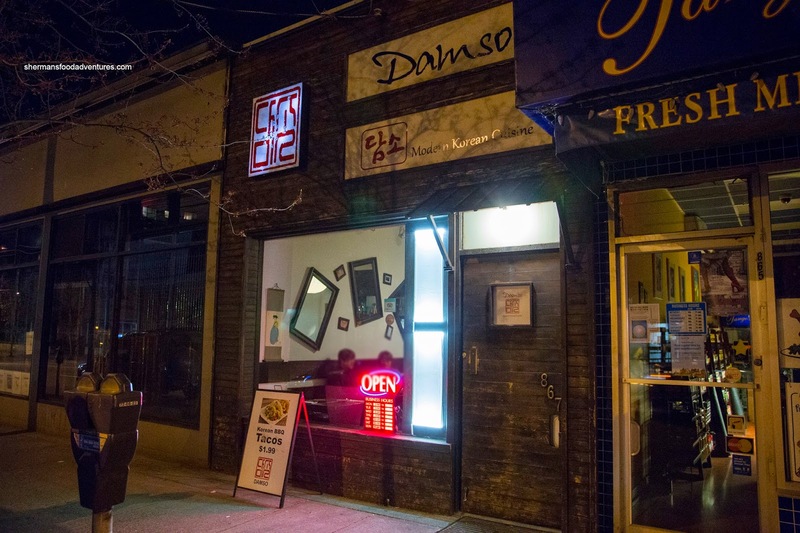 Since it was a late game, we ended up going to a place that has been on my list for a long time - Damso out on Denman. To ensure that we ate this meal with a clear conscience, we got the Kimchi Garden Salad to start (at least there was something green on the table...). 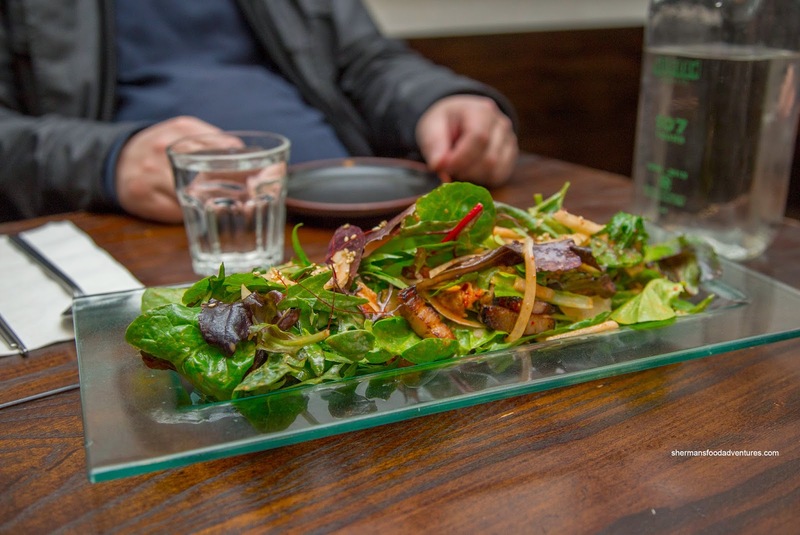 We really liked this concoction of organic spring mix, house-made bacon and of course kimchi. There was a good balance of flavours including the tangy mild spiciness of the kimchi along with the acidity from the dressing. The meaty bacon added body to the salad as well as some savouriness. Next, we tried the Seafood Waffle which did its best impression of a Korean seafood pancake. And in all honesty, we preferred this over the traditional offering. 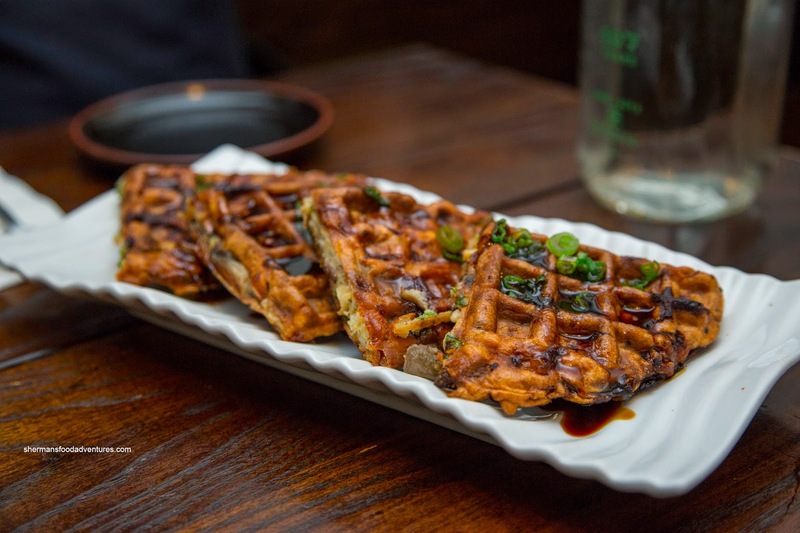 The crispy waffle was packed with seafood and only a bit of green onion. It was not as greasy as a pancake and the drizzle of thick sweet soy only helped amped up the flavours. 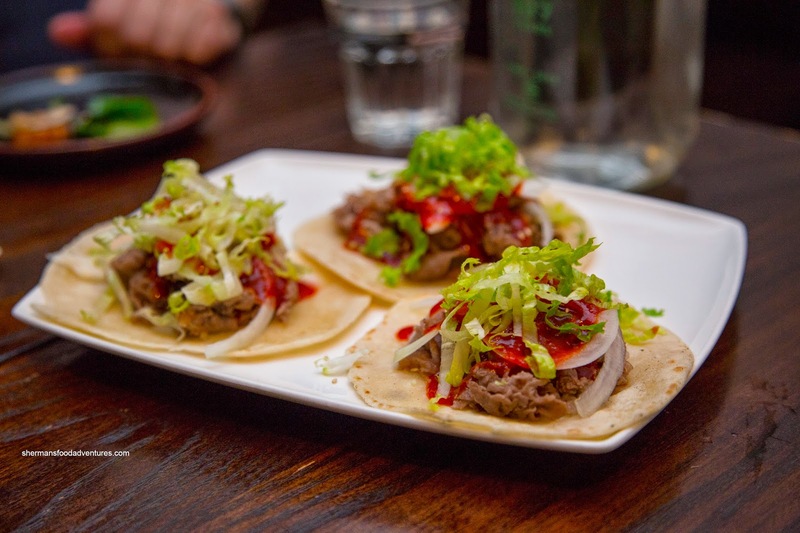 We got one each of the Korean Tacos made with a hand-stretched tortilla, beef belly, onion, cabbage and chili sauce. Although the taco shell was on the drier side, we appreciated its freshness. The beef belly was sliced really thin where it was super tender and moist. The ample amount of chili sauce added both the necessary moisture and sweet spiciness. With poor dish management (my fault), we ended up with the Matang, or yam fries with red wine glaze and a side of maekom sauce. 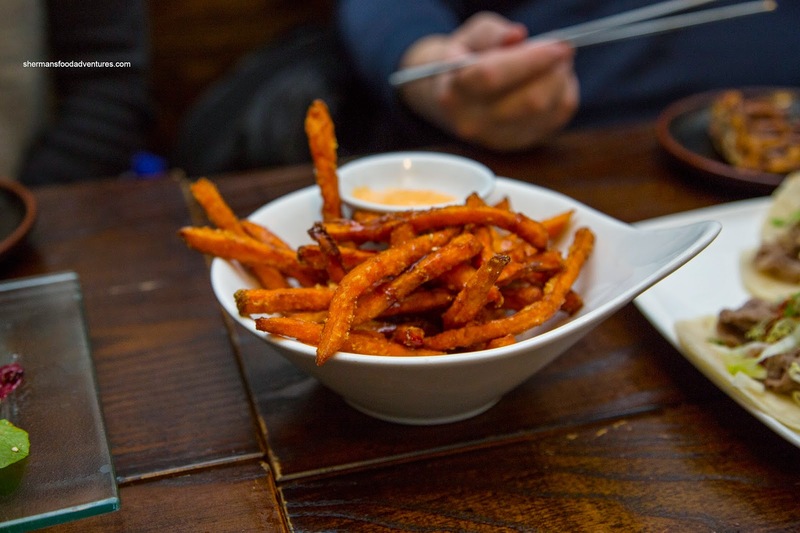 Since I wasn't really paying attention, I failed to see that another dish already had yam fries as a side. Oh well... These were really good being crispy and light. The glaze had a real impact as it added a syrupy sweetness. I liked how they were not overly greasy either. Next up, the Beef Tartare was neatly plated with thin strips of marbled-beef. 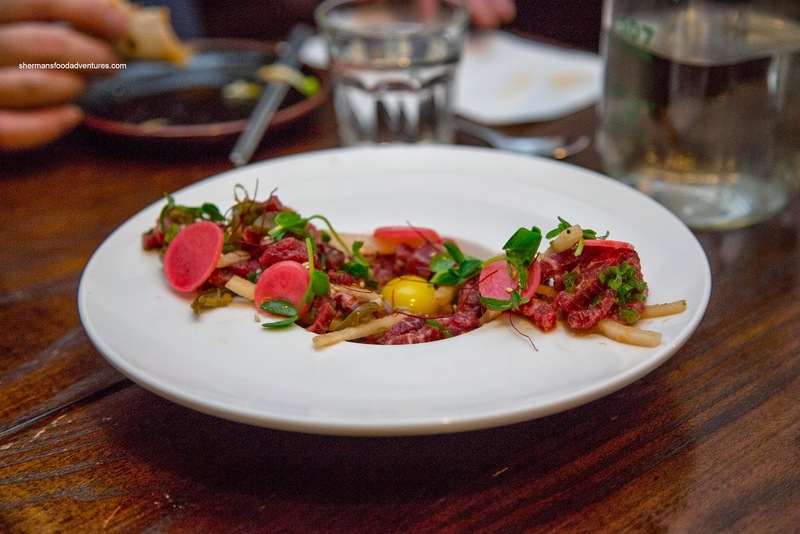 It was accented with Asian pear, green onion, pickled beets, green onions, jalapenos and quail egg. With all of the ingredients mixed together, I thought the flavours were mild, yet not bland. At first, I was concerned with the size of the strips of beef, but it turned out to be buttery and super soft. Naturally, the quail's egg added even more smoothness. However, I would've liked to see more acidity as the flavours were somewhat flat. 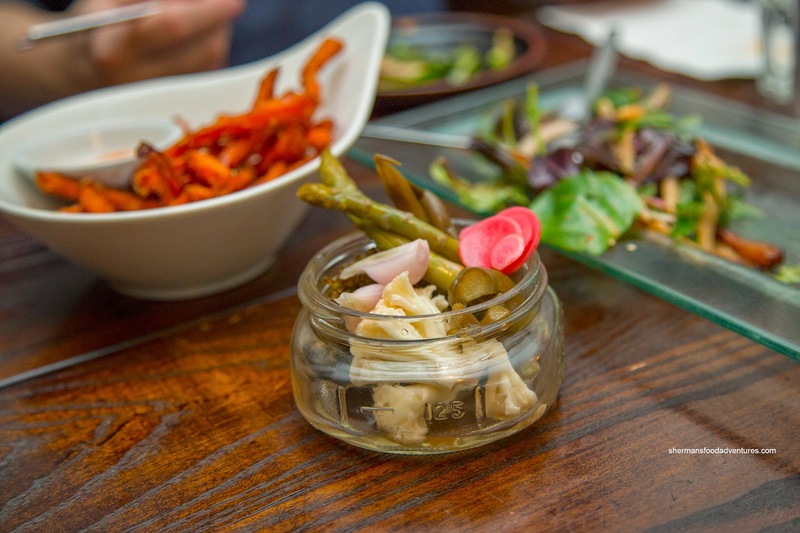 Served in a cute jar, the Pickles consisting of broccoli, cauliflower, carrots, green beans and asparagus were crunchy and preserved with a vinegary brine that had just enough sweetness as a balance. 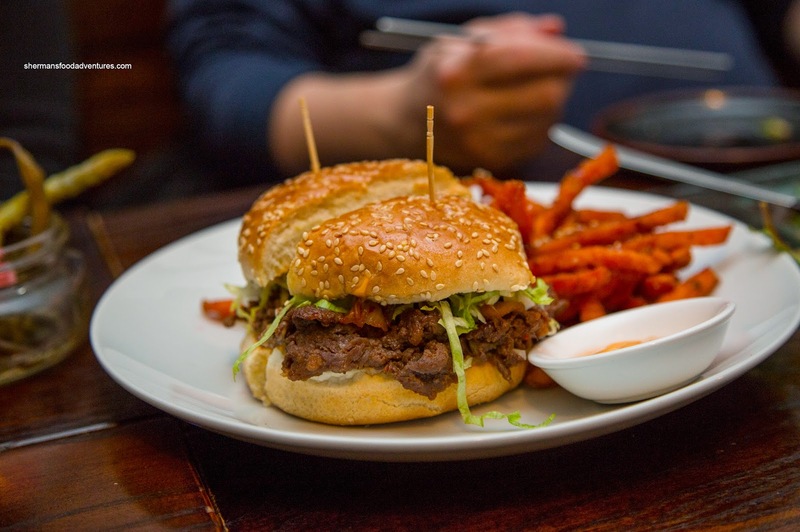 Lastly, we had the Kimchi Beef Bulgogi Burger with yes, yam fries. I thought the sesame bun was a good choice as it was not too dense. Inside, the ample amount of beef bulgogi was moist and properly dressed. Not a ground-breaking dish by any means, but it worked and that can't be said with a lot of fusion food out there. In the end, we felt their take on Korean food was mostly successful. Definitely interesting and tasty eats, especially considering the time (which was well past midnight). - Maybe be even more daring and inventive?